Things are about to get testy between the Snapchat ghost and Twitter's birdie as the popular Internet companies invade each other's space: Twitter has launched a private group messaging feature, while Snapchat added news content. Snapchat released "Discover" on Tuesday, a new section of its app that displays content like articles and videos from news outlets including CNN, the Daily Mail, ESPN and Warner Music. It's all pretty slick, and a far cry from the impromptu disappearing photos and videos posted by users. It's also a potential game changer for Snapchat, opening a portal for professionally-created content -- alongside ads -- that might help to keep users active within the app, and generate serious ad revenue for the Los Angeles-based startup. On Tuesday there was plenty of news to be had, with articles and video from CNN covering the blizzard in the northeast, an op-ed on President Obama's recent visit to India, and a piece from Yahoo News on the first U.S.-based Bitcoin exchange. News delivery, meanwhile, has been a core use of Twitter practically since its launch. 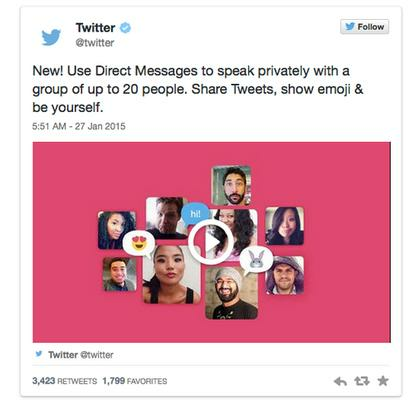 Twitter has had direct messaging for private one-on-one conversations, but not private messaging among groups. For group messaging, there are plenty of other apps, like Facebook's Messenger or WhatsApp. And for something that would eventually disappear, there was Snapchat. But Twitter now has private group messaging too. The tool, which is gradually rolling out to all users, is geared toward letting them talk privately about things they might see or share on Twitter. The ability to converse privately with groups gives you more options for how and with whom you communicate on Twitter," the company said in its announcement on Tuesday. Twitter has also released a new tool to let people record and post video of up to 30 seconds in length within the native Twitter app. Snapchat has offered video recording of up to 10 seconds for some time now. Snapchat and Twitter have traditionally been viewed as providing distinctive services. But the new features the companies are rolling out show how they're encroaching a bit on each other's space, broadening the scope of their services in an effort to keep their users engaged, gain new ones, and grow their advertising businesses. For Snapchat, its Discover section may well draw in users. The content posted on Tuesday was unique, diverse, and slickly produced. One video interview from CNN looked at the trend of "smart drugs" in Silicon Valley, with footage of an entrepreneur gulping down pills by the handful as he sought to increase his brain power. The parallels in the services now offered by Twitter and Snapchat highlight an ongoing trend in similarities in online services provided by other big companies. And for each service, each company has its own strategy. Take search. Facebook has enhanced search around people's posts. Pinterest sees search as a core element of its service, but around images, and the items and activities people are interested in. Meanwhile, most of the popular online consumer companies, like Google, Facebook, Twitter, Yahoo, Snapchat and Tumblr, have made photos a core part of their services.